Fancy donning your Sherlock hat and solving some Victorian crime? We've all been there. Thankfully indie studio Funbakers has set about making that a reality, using ARKit. 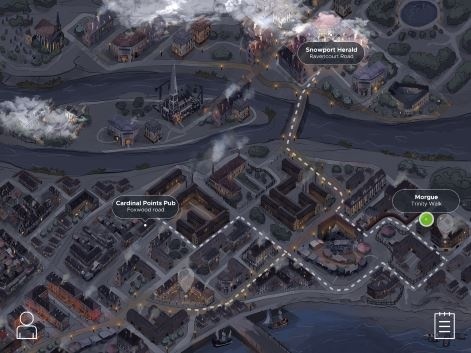 Combining AR puzzle elements and geo-based walking segments, as well as strong interactive storytelling, the Silent Streets series demonstrates what is possible in the AR clue-seeking space. Silent Streets Mockingbird came out at the end of last month. It's the second in the series, following The Boy With The Flower Skin, and the first to make full use of last year's ARKit update to iOS. The game performed well in our own XR Indie Pitch earlier this year and now it's available to play, thanks to publisher Pladius who picked it up. The Virtual Report: Please describe the premise of the game. Demid Tishin: You are a private detective from London staying on business in Snowport – a harsh town of ice harvesters, criminal elements and assorted weirdos. As the name suggests, Snowport is abnormally cold all year round (so I’d recommend moving out as soon as you can). You travel from one location to another and interrogate local people, solving the mysterious murder of the Raven, a local boxing favourite. If you have a modern iOS device, you collect clues in augmented reality, after setting up a murder scene (or even a morgue table) in your cosy living room. What are you most excited for people to encounter in the story? It’s a compact game, so I don’t want to give away too many spoilers, but you definitely need to meet Dr Bellamy at the Sanatorium. He’s my favourite character in the game, probably because of the fantastic voice acting by Sean Antony. It’s interesting how the game’s writer, Richard Cobbett, combined in Bellamy a good heart, strong moral views and cynical negation of ethics at the same time. What can I say? It’s Victorian Britain with all its refinement and contradictions. To do Richard justice, each character has their personality and style – be it the corrupt police inspector, emancipated journalist or the heart of local gossip Compass Rose. What are your inspirations? Sherlock Holmes? We all read the Conan Doyle’s books as kids or watched the films, so yeah, that was a huge influence. Interestingly, my colleague Alex who came up with the concept is also a medical doctor, just like the Sherlock Holmes author, and a big fan of forensics. As for me, I’m inspired by interactive fiction writers like Emily Short or Gavin Inglis, who take risks in storytelling with amazing results. Why did you want to make an AR game? What appeals to you about this format? It started with a Nokia game called The Journey by Mopius Mobile, a minimalistic mystery gamebook with geolocation. Alex played it back in 2009-2011 and suggested we develop the idea – use a different art style, story and setting, and implement the latest technology. The choice of mobile platforms was a no-brainer, as we wanted the player to explore the game world while walking in real life (you can guess Alex loves walking). The first prototype was geolocation-only. Then Pokemon Go was announced, and my other colleague Ilya suggested adding an augmented camera feed to Silent Streets (which made perfect sense for a detective game). The first episode was using simple AR, with objects hanging in the air. Silent Streets Mockingbird, on the other hand, uses Apple ARKit – a much more advanced tech that anchors virtual objects in the player’s surroundings with great precision. Investigating objects is a natural human interest, and ARKit allows players to do exactly that – investigate! Explore the mysterious town of Snowport while you walk around the real world. Is it possible to play it without the AR aspects? For iPhone users there’s also the pedometer feature. You can walk with the phone in your pocket to unlock game locations (and progress in your rank). But we accommodate other playing styles if you don’t want to walk – you can play a Where's Wally-like game and get a few cab rides, or simply wait till you arrive. It has a very distinctive visual style. Most artwork was done by Yauheni Kaikou, an amazing talent from Belarus. We were browsing freelance marketplaces and – boom! – stumbled upon Evgeny’s illustrations to The Old Man And The Sea. We were immediately stunned by his attention to detail and ability to convey emotion. There was no point in looking for someone else, so we worked with him for almost two years on the two Silent Streets episodes. He’s very good at realistic pencil graphics, which was exactly what we needed. We wanted the art to feel like old book illustrations, which you can study for a while, noting a detail here and there. Almost like detective’s work. And Yauheni’s work is so good you actually want to put it on your wall. How was the project funded? Did you get backing for it right from the start? I was putting my personal savings into the game for the first year – I’m infinitely grateful to my wife Rufina who supported this decision and made all of this possible. Then we won the Competitive Start Fund investment programme from Enterprise Ireland, which enabled us to finish and roll the two episodes out there. What are the possibilities of AR in the future? Should more developers be embracing it? The possibilities of AR are immense, I think we just touched [the surface]. Just look at what Game Insight is doing in Guns Of Boom – you can turn on the spectator mode and watch actual teams shooting one another in real time on your table! I also hope The Walking Dead: Our World is going to popularise AR gaming a lot. But even now you can play beautiful puzzle games, sports games, bury and excavate chests, fight tanks and cast spells. 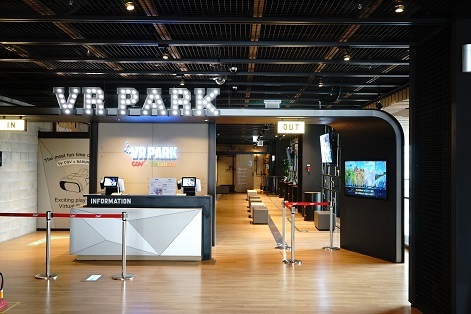 There will be more AR games build around exploration – hidden object puzzles, mysteries and sci-fi games about alternative reality and time travel. 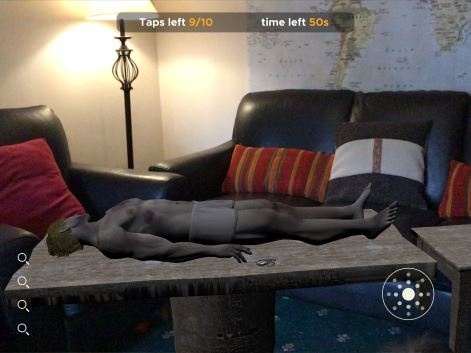 Turn your living room into a morgue using the game's AR features. What can gamers expect to see in future Silent Streets episodes? First of all, we just released update 4.1, which features a fully functional iPad version and a lot of assorted improvements. After we release the 2D Android version, we plan to brush up the old episode, The Boy With The Flower Skin, with the new UI and get it back in stores. As for new episodes, plenty of ideas. We want the player to discover the Science Society’s grandiose plan and who pulls the strings in Snowport. But the future of the series will depend on the success of Silent Streets Mockingbird, so let’s see how it flies. Read more about Silent Streets Mockingbird on our sister site Pocket Gamer, where you can also discover reviews of other popular AR games. 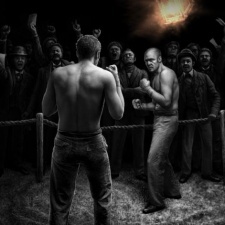 To enter a PC, mobile or AR game in one of our parent company's indie pitch events, visit www.bigindiepitch.com now.